If you are looking for a fun birthday party option for your child in Cleveland, the city has a multitude of venues and attractions to accommodate kids of all ages and interests. Whether you're traveling to the city for your child's birthday or just don't want to deal with cleaning up the mess afterward, consider hosting the celebration at one of these locations. From popular amusement parks like the Memphis Kiddie Park to the hands-on birthday pottery making at Spirit of Clay, you're sure to find a great place to host your kid's birthday party in the Cleveland area. However, as celebration spaces are typically limited at each of these locations, book your reservation in advance and visit each location's website for more information on costs, amenities, and hours of operation. Located on Cleveland's west side in Brooklyn, Memphis Kiddie Park is a great place to host a child's birthday party. The park offers old-fashioned-style kids-size rides, miniature golf, and a classic carousel. Their special party package for groups of six children or more includes unlimited rides for two hours, popcorn, a drink, and a balloon. Birthday parties at the zoo include admission, lunch, drinks, a reserved party area for two hours, birthday surprises for each child including the birthday boy or girl, and a guest appearance from the zoo mascot. Parties are available year-round on Saturdays and Sundays. Call ahead to ensure availability during your trip. If your child is a fan of aquatic animals, birthday packages are available at the Greater Cleveland Aquarium. Designed for children 2 to 12 years old, these events are hosted on Saturdays and Sundays and include unlimited time at the aquarium after the celebration. Booking a birthday party as the aquarium grants you and your children access to a private room for one and a half hours, lunch and a favor bag for each prepaid party guest, and one to three activities. Depending on which package you select, this includes animal encounters, aquatic animal crafts, or feeding the stingrays. With two locations near Cleveland—one in Middleburg Heights and one in Avon Lake—Pump It Up Party Centers provide a fun and safe place to jump, climb, slide, and bounce on the giant inflatable play structures. Parties include time in the supervised party area, a decorated party room, a sound system with popular music playing, table service, and customized invitations for party guests. Prices vary based on the number of guests, day and time of the party, and the amount of time in the party area. Food and drinks are also available for purchase. The Nature Center at Shaker Lakes, founded in 1966, is a peaceful green space nestled among the gracious houses of Shaker Heights, just east of Cleveland. The facility features a variety of trails that illustrate six natural habitats, as well as a nature center with exhibits about the Northeast Ohio landscape. The Center offers "B'earth'day Party" packages for children that include the room rental, dessert, and an hour-long program led by a naturalist. At Spirit of Clay in Mayfield Village, each child designs and paints a bisque from the party bisque collection. Parties include a decorated party room with balloons, your own studio artist, and all the supplies to create masterpieces, and the birthday child will receive a beautiful birthday plate to remember the day. You may bring your own snacks and cake or choose a package where everything is included. Parties at Fun 'n' Stuff in Macedonia can be fun for kids of all ages—including older teenagers! Attractions include laser tag, mini-golf, roller skating, a kid's playground, bumper boats, rock walls, inflatables, batting cages, video games, and Grand Prix go-karts. Party packages include reserved tables with balloons, invitations, table service, birthday candles, mini-golf, video game tokens, pizza, and soda. Add-ons include a private party room, a personal party hostess, and themed parties such as the "gross and slimy science experiment" party. Located in Medina, Ohio, the Romp 'n' Stomp Party Center and Inflatables Play Place is another great place to rent out a room for your kid for his or her birthday party. Also featuring monthly themed parties that are open to everyone, this location could be a great last-minute birthday celebration if you can't find any open reservations. Birthday packages include the Stomper "Themed" Party, the Romper "Deluxe" Party, the Nerf War Party, the Glow Dance Party, and the Escape Room Party. With locations in Mayfield Heights, Mentor, and Parma, Ohio, the classic kids' play place and pizza parlor Chuck E. Cheese's also hosts private and semi-private birthday parties. Reserved birthday packages include unlimited game tokens, assorted balloons, an exclusive performance by the Star Play Ban, and reserved tables for two hours with all the fixings. Roseland Lanes Bowling Center in the Oakwood Village suburb of Cleveland is a great place for a low-hassle birthday party. Offering affordable rates (charged per guest) with two different birthday package options, "perfect" and "ultimate," party guests can enjoy an hour of bowling, choice of pizza or hot dogs, ice cream and cake, and a tour of the back of the machines. One of the most popular attractions for children in the area, the Children's Museum Cleveland is also home to one of the best private birthday rentals in Cleveland. The standard birthday package includes entry into the Museum for up to 40 guests and two hours in a private birthday room featuring food, drinks, and decorations. Get dressed up in period fashion from the Wild West and test your wits in a custom Escape Room at Downs on the Farm in Amherst, just a few miles west of Cleveland. Additionally, the party package includes two hours on the farm for 15 to 29 guests, unlimited train rides and time at the petting zoo, and access to the activity barn, kitchen, and bathrooms. For another farm experience, consider hosting your child's birthday party at NickaJack Farms in North Lawrence. There are several party packages to choose from including the Tractor Party, which features a 30-minute hayride, a tractor for kids to climb on, and self-guided access to Barnyard Animals, Discovery Barn, the indoor picnic area, and the Rascals Round-Up game. 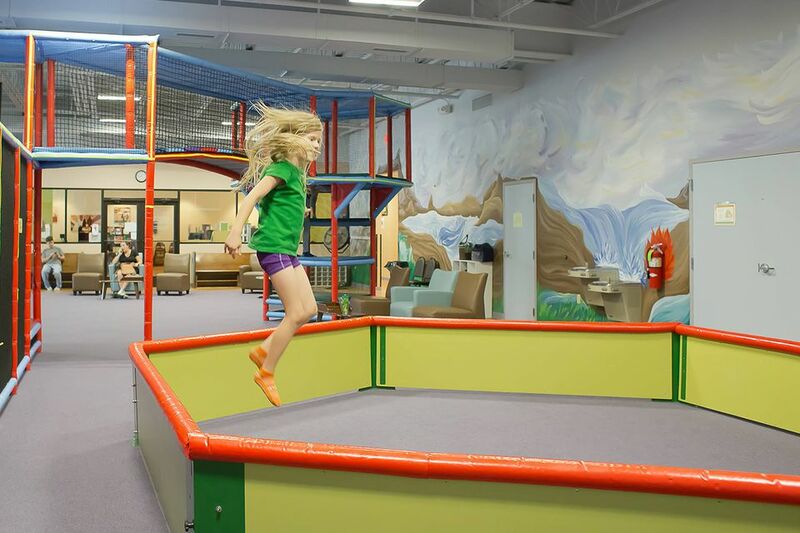 Cafe O'Play is one of the area's best entertainment centers for small children, encouraging explorative hands-on learning in one of Cleveland's biggest indoor playgrounds. Enthusiastic "Party Heros" at Cafe O'Play take care of all the details for planning your child's birthday party—from customized games and creative play to individualized decorations and cakes. Renting one of the rooms comes with admission for all guests to the large playground as well.